At PRIIA® Cosmetics, we have carefully selected ALL of our ingredients to not only be 100% acne-safe but also benefical to acne-prone skin types. Every raw material in our products serves an important function to overall appearance, texture and performance. Unlike many other brands, our products are not full of 'fillers'. These high standards ensure the consumer an end product that actually contributes to the overall health of their skin; not just to look pretty in packaging. We formulate mineral makeup that is free of any pore-clogging ingredients; even natural ones such as shea butter, coconut oil and so many others. Just because it's a 'natural' ingredient doesn't mean it won't clog pores and contribute to acne breakouts. Our entire Minerale-Derm line is 100% Gluten-Free. We also hold our furry friends close to our hearts- we DO NOT engage in animal testing, nor do we purchase from suppliers who engage in animal testing. We are certified CRUELTY-FREE through PETA's Caring Consumer Program. Mica: Also known as muscovite. Almost colorless, mica is a silicate mineral that has a layered structure made up of thin layers or flakes. Mica is used in cosmetics for it's ability to add luster, shimmer and sparkle. Zinc Oxide: Provides a silky smooth texture and offers good coverage in our formulas. Zinc is also known for it's non-irritating effects on the skin. Titanium Dioxide: An opaque, pure white pigment extracted from titanium-bearing ores. Titanium helps to provide excellent coverage in cosmetics and also refracts light away from the skin helping to hide minor skin imperfections. Iron Oxides: Inorganic colored pigments created from natural metals that have been oxidized by salts and water. These pigments are extracted from the earth and go through a refining process in order to be safe for use in cosmetics. Ultramarines: Includes ultramarine blue, ultramarine pink, ultramarine violet. These inorganic pigments are made from combinations of kaolin clay, sulfur and sodium carbonate and then put through a heat treating process to produce their brilliant colors. *Not FDA approved for use on the lips. Kaolin Clay: A mild clay, also called China Clay, that works well for absorbing excess moisture and sebum off the surface of the skin. Boron Nitride: A premium, inert and non-toxic mineral that provides a beautiful 'slip' or soft feeling to mineral makeup. Boron also helps mineral makeup adhere to the skin in place of using stearates, plus it has been shown to have antibacterial properties. Silica Spheres: Silica is the most abundant mineral in the earth's crust and most commonly found in nature as sand or quartz. It has amazing oil-control properties and because of the spherical shape, it scatters light and blurs the look of enlarged pores, fine lines and wrinkles. Silica also gives an amazing 'slip' or soft feeling to mineral makeup. Pearl Powder: An ancient beauty secret in Asia for 100's of years, pearl powder is made from freshwater pearls. It contains 20 amino acids along with approximately 31% Calcium and 56% protein. The most important benefits of pearl powder are: absorbs oil & skin impurities, helps the skin to feel smooth, and contains a natural moisturizer. 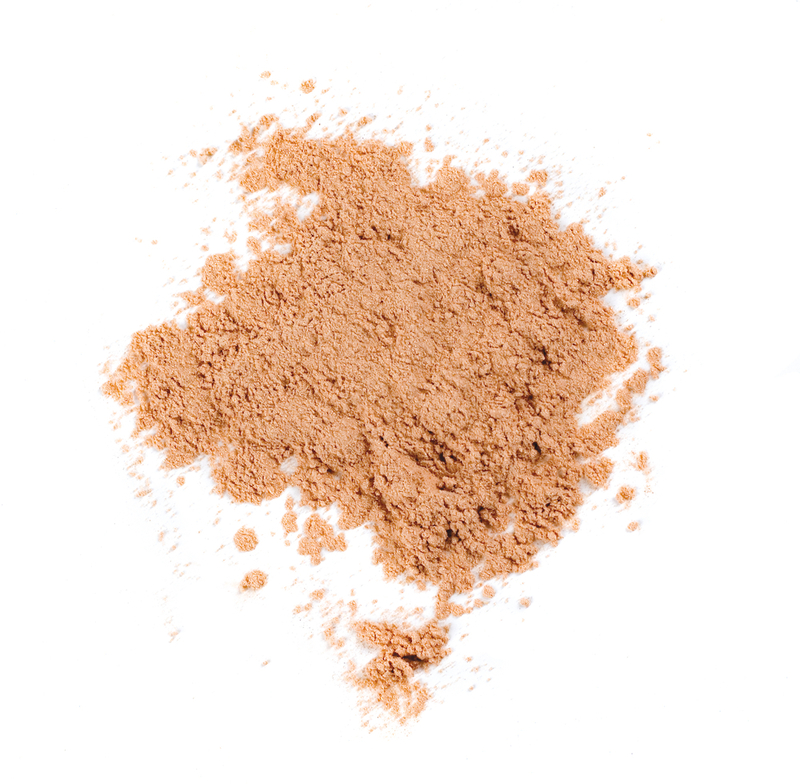 Pearl powder is perfect for all skin types. DERMA-CBI™ Complex: Our proprietary powerhouse cocktail of soothing and skin conditioning botanicals such as Green Tea Extract, Licorice Root Extract and Olive Leaf Extract. This intense botanical trifecta not only helps to protect the skin barrier but it also encourages a healthy-looking and radiant complexion. It's a 'must-have' for those with acneic skin types! Allantoin: A botanical extract of the comfrey plant, allantoin is used for its soothing properties. A wonderful ingredient for those with problematic skin types, especially acne-prone skin. Safflower Oil: Obtained from the seed of the safflower plant. Our safflower oil extremely high in linoleic acid; an essential fatty acid found to be deficient in acne skin types. Safflower oil also helps to prevent TEWL (Trans-Epidermal Water Loss). It's non-comedogenic and non-acnegenic. Meadowfoam Seed Oil: Meadowfoam is an herbaceous winter annual plant native to the pacific Northwest region of the United States. The oil from the Meadowfoam plant is recognized for its outstanding oxidative stability and higher in linoleic acid and lower in oleic acid. It helps revitalize stressed skin while also helping to prevent TEWL (Trans-Epidermal Water Loss). It's non-comedogenic and non-acnegenic. Red Raspberry Seed Oil: We LOVE using this oil in our lip products. It's is rich in antioxidants and high in linoleic acid. It is non-comedogenic and non-acnegenic. Totarol: A powerful natural preservative obtained from the totara tree (Podocarpus totara) native to New Zealand. Totarol is active against both gram positive and gram negative bacteria. This includes the bacteria, Propionibacterium acnes (p.acnes), which is associated with acne. Orchid Flower Extract: Orchids have long been used for protective and moisturizing properties. Orchid extract helps to restore and maintain a bright and radiant complexion and also to achieve a smoothe and flawless complexion. Hyaluronic Acid: A natural polysaccharide (large sugar molecule) made from a biofermentation process. Hyaluronic acid, also known as Sodium Hyaluronate, is the most powerful moisturizer and humectant known thus far. It provides a wonderful smoothness and softness to the skin. Hyaluronic acid occurs naturally in the body such as connective tissues, joints and skin. Have questions in regard to the ingredients we use? Please feel free to contact us. Full ingredient disclosures can be found on individual product catalog pages on this web site.